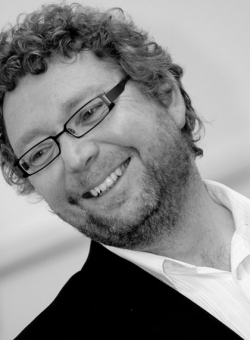 Simon Wright is a food writer, broadcaster, restaurateur and former Editor of the AA Restaurant Guide. "Revelatory, principled and entertaining, this enjoyable book explains why so few of our restaurants are excellent and so many mediocre". "The authentic stench of the top flight kitchen, be it sweat, blood or veal jus...a delicious tale". Simon's new book "The Wright Taste" was published in late October 2008 to coincide with his TV show (see below). Simon's series for BBC Wales "The Wright Taste" was first shown in October 2008. In the show Simon takes to the unfamiliar surroundings of the farm to produce food fit for top restaurant tables – the show features guest appearances from Gordon Ramsay and Heston Blumenthal. Simon's BBC Radio Wales series "Wales On The Menu" was first aired in March 2010. A second series is in production and a third has been commissioned. Simon has completed a 20 part series for Channel 4 entitled "Make Do And Mend". He is co-presenter of the series which aired across the UK in April 2011. Simon has appeared on Radio Four's Loose Ends, as well as radio shows with Sandi Toksvig and Vanessa Feltz amongst others. He regularly broadcasts on food topics for Radio Wales and on the BBC Wales consumer programme X-Ray. Simon has worked as the "Restaurant Consultant" on every episode of "Ramsay's Kitchen Nightmares." His role it to visit the selected restaurants before filming and report to Gordon Ramsay with an analysis of the problems of the restaurant and proposals for putting them right. Simon is a partner in Y Polyn an award winning country pub restaurant in West Wales. "Y Polyn is a model of its kind: a simple country restaurant set up by people with good taste who know what is nice to eat and how best to serve it." Jay Rayner, The Observer, September 2006. Y Polyn was named as AA Restaurant of the Year for Wales 2009/10 in September 2009. Simon is developing a new restaurant project on Llanelli Waterside with rugby players Stephen Jones and Dwayne Peel and construction entrepreneur Robert Williams. Sosban will open in June 2011. Simon was brought to public prominence in 2002 when he was at the centre of a row involving Gordon Ramsay, his former protégé Marcus Wareing and the MD of a motoring organisation. There was huge publicity surrounding this disagreement which resulted in Simon resigning on principle.......... this is just one of the fascinating stories Simon has to tell during his speaking engagements.